I love Ms. P-Dubs. Note: She gave herself that nickname. That’s part of why I love her. Of course, I’m talking about Ree Drummond, Pioneer Woman. 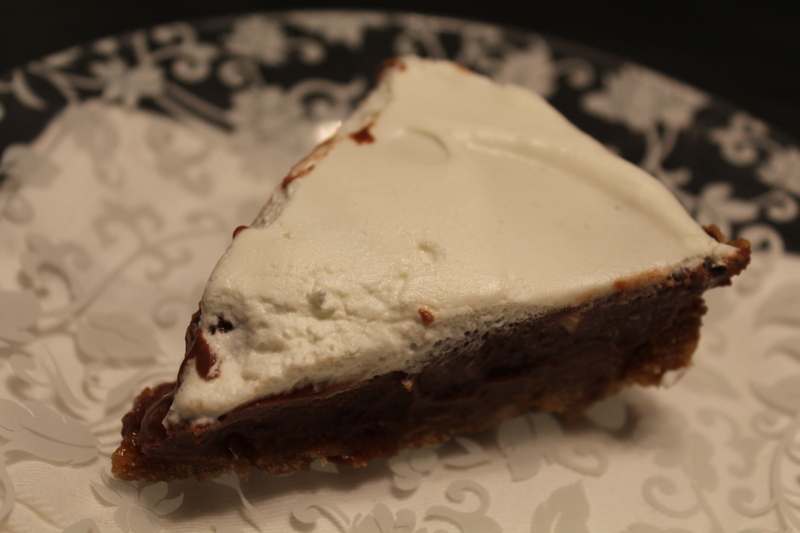 When I saw her recipe for chocolate pie, I thought of a few chocolate-lovers in my life that I’m sure would really enjoy having a piece. Luckily, most of them were at a Friendsgiving gathering that my dear friends, Lauren and Kyle, hosted yesterday. I followed the recipe exactly. There is no way to improve it. It’s just that good. That is the one piece that was left. Mind you, there were nine adults there, and I made another dessert too (which I’ll share with you later in the week). Ree didn’t specify what kind of crust was best to make with this (she suggests store-bought graham cracker or oreo). I decided to use the homemade graham cracker crust my mother-in-law uses with her banana cream pie. Combine all ingredients well and press into a 9 inch pie pan. Bake at 375 degrees for about 6 minutes. I poured the chocolate pudding into the crust before the crust was completely cooled and it was fine. Then, I refrigerated the pie uncovered overnight, so it would really firm up. For the topping, I just took a hand mixer to 4 ounces of whipping cream (which is the amount that was left in the half pint carton of whipping cream after I made the pudding), and spread it on top of the cooled, already had been in the fridge overnight, pie. The night of Friendsgiving, after I went home, I received 2 “the pie is delicious” texts, and my husband ate the last piece of pie shortly after the above photo was taken.